MacBook air....pro, whatever you call these things, 8gb, brand spanking new in the box. Wife won it at work. 750 plus shipping. My dad has the new Mac, and it is FAST! OS-X is very nice to use as well. GLWTS. Depending on specs I am interested. Any more details? Yeah, there should be a label on the bottom of the box you can shoot a photo of that'll detail the specs. Here's a quick edit for you there, Tony. Nice specs on this unit. 256GB PCIe SSD << this disk technology goes a long way in computer speed these days. SSD sata drives were already a nice upgrade, but the PCIe stuff is even faster. Man, I kinda want this thing now, myself! Have at it fellas. Gee man, can you take a worse photo and post it. I am interested. Any chance you could divulge if it is pro or air? Even though I am ridding myself of these spoiled apples, my wife likes that it just works. Full disclosure. If it pisses me off. I will very likely get rid of it. But at least I took it off your hands, if I do get it. Hope all is well Tony. This is a good deal, as MSRP is $1,200. Yeah man, sorry about the crappy pic. 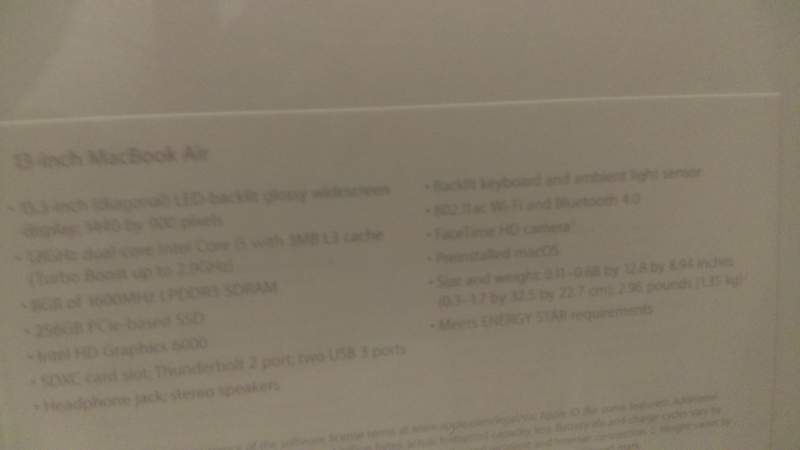 Says MacBook air on the box. I would probably just keep this myself and give it a whirl but considering what I just spent on frickin' trees, I need to replenish the ol' wallet. MSG, thanks buddy for the edit on my crappy pic. No secret there, as a corporation I'm not fond of them, but I am willing to give their product a try since the wife got it as part of a contest. Would I go out and spend 1200 on a laptop....no. Unfortunately I need the cash more than I need a laptop. Tell pops to buy it for ya. It's an investment in your future. Ha. No hate. After owning the X for 7 or so months now, just discovered portrait mode for photos. Was about to sell the phone, but now I can’t stop taking pictures of everything. Very nice! Tony. Great deal you are offering. Was hoping it was the pro. But who knows, evening beers may influence my thoughts. 16 GB of 2333Mhz RAM, Nvidia GTX 1070 graphics card, Asus motherboard (can’t remember the model number) Intel Xeon core of an older generation, although still quick (soon to be 2 Xeons), I don’t have a cooler capable of overclocking... yet. None of this is new, but it is a respectable rig. Cost quite a bit though, had to pay for most of it myself. I was saving 40% of all of my money for a LONG time, probably 3 years. Everyone who comes into my room sees the Dell tower and says to themselves “weak computer.” Then they play a round of FortNite and are blown away! Quick! Someone get me into DECON! I've got geek all over me! Victor says sold, why he wants to view cleaner HD pics of Russ is beyond me, but consider this sold . Thanks pal. So did this sell? My laptop broke and a need a new one for school? I believe his iPhone 3g did sale. The thread title states MacBook Pro. With a picture as clear as a Bigfoot sighting. Haha. Kidding. Congrats on the sell. Yes, it sold. If anything changes I'll post it here but so far...done deal. Ok well let me know if it doesn’t go through I’ll take it. I’m looking at some sale on Amazon, but nothing really good. The MacBook Air arrived today, exactly as described and double boxed to boot. Got here in only a day. My wife is thrilled and she will be using this for work. Thanks so much Tony! Attaboy, Victor. Give her the tools that she needs to succeed! Nice one. Thank you too Victor for the smooth transaction. Enjoy.